I was lucky enough to have spent this holiday weekend in the great outdoors and there was something so magical about it. 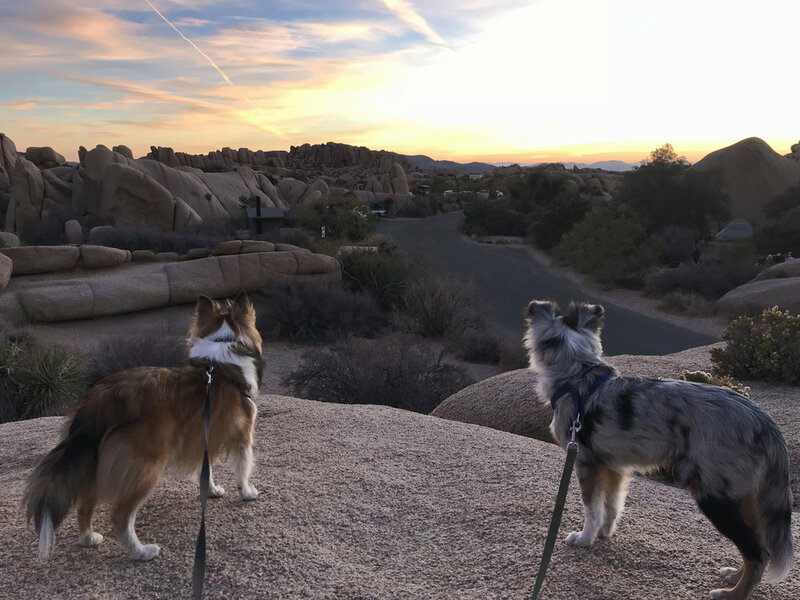 My husband and our pups spent a day in Joshua Tree; it was our first time including Laddie and Beau in our outdoor adventures and it was great seeing how excited they were to be in a new environment. At times I tend to get overly caught up with life and forget to appreciate the beauty that the world has to offer. I had been dying to go camping for a while; I was seriously way overdue for a trip. Now that I sit here and think about it, I think I was seeking for peace and stillness in my life. For some time now, my mind has been a little cluttered with a million and one things and I forget to sit down, relax, and breath for a second. Being outdoors, without cell service, without the noise of the city, with my three beloved boys did my soul good. Taking some time off from the world is something I suggest you try out. Self-care of your mind, body, and soul are super important in order to live a happy and healthy life. Looking up at a night sky full of stars and watching the sun rise did just that for me. Quite frankly I am not the most outdoorsy person out there, although sometimes I’d like to think that I am. I hate the part where I don’t shower for a day or have dirt under my nails but I guess there’s a beauty about letting go of that and being present in the moment, as smelly as you may be. I had such a great time bonding with my husband, Laddie, and the newest member of our family, little Beau. The simplest things in life are ones that bring me joy. Give it a shot, you'll thank me later!